What is the importance of the gathering for the discussion of primacy in the Church? It defined a theological consensus which was formulated during the years of preparation for the Pan-Orthodox Council. The essence of this consensus is that primacy at the universal level is recognized to be important for the Church. However, the forms and content of this primacy remain debatable, for they are thought of in different local traditions in various ways. 1. The topic of primacy in the Universal Church is one of the most important in Christian ecclesiology alongside the topics of conciliarity and the unity in the Church. The history of the theological interpretation of primacy was dominated for a long time by the subject of papal primacy posed by the Roman Catholic Church. As a result the Orthodox teaching on primacy found itself wholly dependent on this discussion and was represented mainly as an anti-papal polemic. In the twentieth century the situation changed: there appeared in Orthodox theology attempts at a positive (non-polemical) opening of the problem of primacy in the Churchits. These attempts engendered a theological discussion in the Orthodox milieu. At present the topic of primacy is one of the fundamental topics in the Pan-Orthodox pre-Council preparatory process and in Orthodox-Catholic theological discussions. The practical importance of the topics of primacy and conciliarity at the Pan-Orthodox level was demonstrated in Istanbul from 6th to 9th of March this year by the gathering of the First Hierarchs of the autocephalous Local Orthodox Churches. The heads of the autocephalous Local Orthodox Churches took the joint decision of holding a Pan-Orthodox Council in 2016, provided that unforeseen circumstances do not arise. It is very important that the decisions at the Pan-Orthodox Council are arrived at by consensus – in this manner no single Church will find herself in a minority and no decisions will be taken that do not meet with the approval of at least one of the Local Churches. The Council will be presided over by the primus inter pares, the Patriarch of Constantinople. At the same time he will be surrounded by the First Hierarchs of the Local Orthodox Churches so that the external image of the Pan-Orthodox Council will not resemble a Catholic Council, at the head of which sits the Pope, while all the bishops are to be found in the hall. The primacy of the Patriarch of Constantinople at the Council will be a reflection of the Orthodox teaching on the Church by which the autocephalous Local Orthodox Churches are headed by First Hierarchs equal in dignity: the Patriarchs, Metropolitans, and Archbishops. 2. What is the importance of the gathering for the discussion of primacy in the Church? It defined a theological consensus which was formulated during the years of preparation for the Pan-Orthodox Council. The essence of this consensus is that primacy at the universal level is recognized to be important for the Church. However, the forms and content of this primacy remain debatable, for they are thought of in different local traditions in various ways. The problem of the correlation between primacy and conciliarity also remains debatable. They are debatable because at the present there is no single ecclesiological model which could delineate these problems in such a way that all of the autocephalous Local Orthodox Churches would agree with them. This can be seen by the polemics arising within Orthodox theological thought itself. Unlike triadology and Christology, the teaching on the Church does not fall into the realm of Church Tradition where there is a normative terminology and affirmed in a conciliar manner dogmatically. Today ecclesiology is an area of theological research, an area in which theologians propose various, at times incompatible methodological approaches and models, they conduct polemics and as yet do not demonstrate unity. This is true too in relation to separate but interrelated ecclesiological concepts such as primacy and conciliarity. The dialogue on the correlation between primacy and conciliarity is conducted in the Joint International Commission for the Theological Dialogue between the Orthodox Church and the Roman Catholic Church. However, at present in this dialogue there has taken precedence only one of the possible approaches to the topic of the correlation between primacy and conciliarity connected with the theological ideas of Metropolitan John Zizioulas of Pergamon. Metropolitan John’s personal contribution to the development of Orthodox theology is significant and his ecclesiology is of course worthy of being studied, but the precedence of a single point of view to the detriment of others harms theological dialogue since it narrows the area down for discussion. The Russian Orthodox Church as a participant of this dialogue through the endeavours of the Synodal Biblical-Theological Commission has prepared a document entitled The Position of the Moscow Patriarchate on the Issue of Primacy in the Universal Church. The document proposes a theological vision of the problems discussed in the context of the Orthodox-Catholic dialogue. The document was confirmed by the Holy Synod of the Russian Orthodox Church at its session on 25 to 26 of December 2013. The document’s appearance underlines the importance for the Russian Orthodox Church of Orthodox-Catholic dialogue and the problems that it examines. 3.What does the Russian Orthodox Church propose in her document on primacy? I will focus on several key propositions of the document which, in my view, may become a beneficial contribution to the discussion on primacy both within the framework of dialogue in the Joint Commission and further afield. First of all, I would like to note that the document affirms the already formed consensus between the autocephalous Local Orthodox Churches regarding the importance of primacy at the universal level. The document not only does not deny primacy at the universal level, but also states that at the present this primacy ‘belongs to the Patriarch of Constantinople as first among the equal First Hierarchs of the Local Orthodox Churches’ (2.3). The document also states that ‘the way the content of this primacy is filled is defined by a consensus of the autocephalous Local Orthodox Churches, expressed, in particular, at Pan-Orthodox convocations for the preparation of the Holy and Great Council of the Orthodox Church’ (5), which in particular was demonstrated by the gathering that took place in Istanbul. Primacy, as it has formed historically in the Church, is viewed in the document on the three levels of ecclesiastical organization: the diocese, the autocephalous Local Church and the Universal Church. This structure is borrowed from the document of the Joint Commission called The Ecclesiological and Canonical Consequences of the Sacramental Nature of the Church, known as the Ravenna document, which also describes the three levels of church order. This document was not accepted by the Russian Orthodox Church in that part concerning primacy in the Universal Church. The Position of the Moscow Patriarchate explains why this part of the Ravenna document is unacceptable to the Russian Church. In comparing the two documents we discover one difference. In the Ravenna document primacy in the Church is viewed on the local, regional and universal levels. In our view, this division does not fully correspond to the principles of church order as accepted in the modern-day Orthodox Church. The principle of regional primacy is applicable to the system of the ancient metropolias. However, the contemporary Orthodox Church is structured differently: within her there is the canonical territory of the autocephalous Local Church (which according to the logic of internal order may be considered to be the successor of the ancient metropolia) and the Diaspora, where there are parishes and dioceses located in the jurisdiction of the autocephalous Local Churches. Primacy as described in the Ravenna document at the regional level can be applied to the autocephalous Local Churches only within the framework of their canonical territories; however, in relation to the Diaspora the introduction of the regional level distorts the real embodiment of primacy on these territories. For each ecclesiastical units in the Diaspora (a diocese or a parish), the primate is the First Hierarch of the autocephalous Local Church to which this ecclesiastical unit belongs, and not at all the bishop of the autocephalous Local Church who is first according to the Diptychs in the given region of the Diaspora. The document of the Russian Church views primacy not on the regional level, but on the level of the autocephalous Local Church, which corresponds more to the contemporary structure of the Local Church. A) At the level of the church diocese primacy belongs to the bishop. This has as its source the ‘apostolic succession conveyed through ordination‘ (2.1), which includes the election, laying on of hands and reception by the Church. As a successor to the apostles placed in this ministry through episcopal ordination, the bishop celebrates the Eucharist and heads the church gathering. In celebrating the Eucharist, he is the image of Christ ‘on the one hand representing the Church of the faithful before the countenance of God the Father, and on the other conveying to the faithful God’s blessing and sustaining them with true spiritual victuals and the partaking of the Eucharistic Mystery’ (2.1). The bishop (either himself or through those whom he has blessed) receives into the Church new members through the sacraments of Baptism and Chrismation. In his diocese he organizes church services by virtue of the charisma of administration conveyed to him at his episcopal consecration. The primacy of the bishop in the diocese is in its nature sacramental. B) At the level of the autocephalous Local Church primacy belongs to the ‘bishop elected as the First Hierarch of the Local Church by a Council of her bishops’ (2.2.). The source of the First Hierarch’s primacy is the act of his election by the Council of the autocephalous Church. The First Hierarch carries out his ministry of primacy in accordance with the common Church canonical tradition expressed in the 34th apostolic canon (2.23). The powers of the First Hierarch of the autocephalous Local Church are defined by the Council and fixed in the Statute. He administers the autocephalous Church not by himself in isolation but in cooperation with the other bishops (2.2). The primacy of the First Hierarch of an autocephalous Church in its nature is conciliar. C) At the universal level ‘primacy is defined in accordance with the tradition of the holy Diptychs and is a primacy of honour’ (2.3). The source of primacy is the recognition by all the autocephalous Local Churches of the order of the Holy Diptychs (2.3), i.e. the Pan-Orthodox consensus regarding who is first relying upon the tradition of the Diptychs. The tradition of the Diptychs goes back to the canons of the Ecumenical Councils (3rd canon of the II Council, 28th canon of the IV Council, 36th canon of the VI Council). But the canons only confirm the consensus regarding the primacy of honour which existed in the Church from the moment when it was accepted. In these canons primacy belongs to the Church of Rome, and second place is given to the Church of Constantinople on the grounds that this See is located in the capital of the Empire (‘the city of the Emperor and Synkletos’) – the 28th canon of the IV Ecumenical Council. After the break in communion with the Church of Rome, primacy was not automatically transferred to the Church of Constantinople because the canonical rules did not provide for such a procedure, yet at the same time a Pan-Orthodox consensus was reached that primacy belongs to the See of Constantinople in this new situation. After the fall of the Byzantine Empire, this consensus was retained despite the fact that Constantinople had ceased to be the city of the Orthodox Emperor (which means that the reason for its primacy in the 28th canon had now been lost). At present there is no single Pan-Orthodox consensus concerning the Diptychs, but there is consensus concerning the first five Sees, namely: Constantinople, Alexandria, Antioch, Jerusalem and Moscow. Unlike the First Hierarch of an autocephalous Church, the first-in-honour Ecumenical Primate is not elected as such by a Pan-Orthodox Council, and by virtue of this he does not administer the Universal Church since he has not been empowered to do so by the episcopate. As primacy on the three levels of church order has a different nature and source, ‘the functions of the primates at various levels are not identical and cannot be transfered from one level to another’ (3). ‘The transfer of the functions of ministry of primacy from the level of the diocese to the universal level, in essence, would mean the recognition of a special type of ministry, a “universal bishop” possessing the right to teach and administer throughout the whole Universal Church’ (3). This recognition does away with the sacramental equality of the episcopate and leads to the appearance of a jurisdiction of a Universal First Hierarch, of which neither the sacred canons nor patristic tradition have anything to say. The consequence would be a diminution of the autocephaly of the autocephalous Local Churches. ‘The expansion of the primacy characteristic of the First Hierarch of an autocephalous Church (according to the 34th apostolic canon) to the universal level would give to the primate in the Universal Church special powers independent of the consent to this of the Local Orthodox Churches’ (3). Such a step would require the corresponding transfer of the procedure of election of the first bishop to the universal level, which would lead to the infraction of the right of the first autocephalous Local Church to elect independently her First Hierarch. The primatial First Hierarch would have to be elected at a Pan-Orthodox Council from among the whole episcopate of the Orthodox Church. 4.The position on the varied nature and the various sources of primacy at different levels of church order as expounded in The Position of the Moscow Patriarchate was greeted with criticism. In particular, Metropolitan Elpidophoros of Bursa in his article ‘Primus sine paribus’ wrote that the Moscow document transforms primacy ‘into something external and therefore alien to the person of the first hierarch’. Instead of this he suggested that we consider that any ecclesiastical institution ‘is always hypostasized into a person’ and that the source of primacy at all three levels of church organization is the First Hierarch himself. In his theology Metropolitan Elpidophoros follows the personalist approach of the ecclesiology of Metropolitan John Zizioulas. 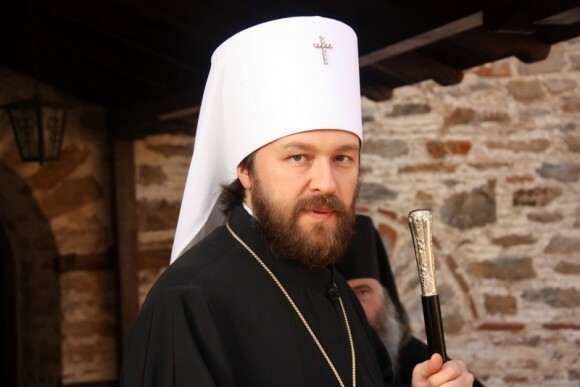 I will not go into the theological content of Metropolitan Elpidophoros’ article, but will briefly remark only that it goes far beyond the approach of Metropolitan John. From the perspective of the ecclesiology of Metropolitan John, only a local Church can be ‘hypostasized’ into a person, and this ‘hypostasization’ is connected with the Eucharist which is celebrated always locally. The bishop’s ministry, according to Zizioulas, has a dual source – eschatological (as the alter Christus), and historical – in the apostolic succession (as the alter apostolus), and therefore we cannot say that the First Hierarch is the source of his primacy. In the metropolitan Elpidophoros’ article for the first time from an Orthodox hierarch we hear the assertion that the Ecumenical Patriarch is not primus inter pares, but primus sine paribus, that is, like the Pope of Rome, he is elevated above all the other First Hierarchs of the Local Orthodox Churches. The problem here is not so much that this ecclesiology is bad in itself as in the fact that it does not correspond to the two-thousand-year-old Tradition of the Eastern Church, and in particular to the polemic against the Roman doctrine of the Pope which was expounded for centuries by Orthodox theologians. Of course, in the context of the Orthodox-Catholic dialogue an attempt at bringing together the two ecclesiological models – Western and Eastern – can have its place. Yet if this happens by means of one side renouncing its own tradition, by the artificial imposition of one model over another, then the Orthodox Church ought to raise her voice in defense of her ecclesiological understanding. So far only the Russian Orthodox Church has done this, but I am convinced that by the time the plenary session, set for September of 2014, of the Joint Commission for the Orthodox-Catholic Dialogue is called, the consensus on the position of the Russian Church in her document will be much wider than it appears to be now. I foresee that the September session of the Joint Commission will not end with the signing of a document on primacy, on which the commission has worked over the last few years, since this document (now placed under an embargo) departs quite radically from Orthodox ecclesiology. 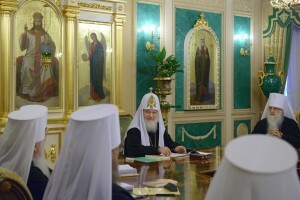 I would like to emphasize once again that the Russian Church not only does not contest the primacy of the Ecumenical Patriarch within the family of the autocephalous Local Orthodox Churches, but that she attaches great significance to it, as expressed particularly in our willingness to take a constructive part in the preparation of the Pan-Orthodox Council. Yet we believe that this Council ought to show to the world precisely the Orthodox model of church order. That is why we have insisted that the president of the Council, the Ecumenical Patriarch, as primus inter pares, ought to preside surrounded by his brothers – the First Hierarchs of the Local Orthodox Churches, and not separately from them, on a specially prepared throne. I shall repeat my thought that I uttered at the very beginning of my presentation: today ecclesiology is an area of theological research in which there exist different opinions regarding the models and methodological approaches to the teaching on the Church. And not a single of these approaches can have any claims to universality – that is why we are in a theological dialogue! In this situation one ought to take into account the various approaches and on the basis of analyzing and interpreting them one ought to strive for a theological synthesis. I would like to hope that the position of the Russian Orthodox Church will be heard, and that the document will be read constructively. The Russian Orthodox Church, in publically presenting her position on the problem of primacy, has declared her intentions for open discussion. We hope that our document on primacy will open a new chapter in theological dialogue in which there is a place for responsible and constructive criticism, but no place for fruitless and dangerous confrontation.